An Exotics Racing experience is the perfect gift for birthdays, Christmas, Valentine's Day, Father's Day, bachelor party, graduation, group events and more! GIVE THE GIFT OF A LIFETIME! "The whole experience was perfect. Everyone from the pro drivers to the behind the desk people were pleasant and helpful. Thank you guys very much! I'll be back again." ENDLESS SMILES & MEMORIES. THE ULTIMATE GIFT FOR HIM! What a blast! Everyone at Exotics is friendly, knowledgeable, and professional. THERE IS NO SUCH THING AS HAVING TOO MUCH FUN! 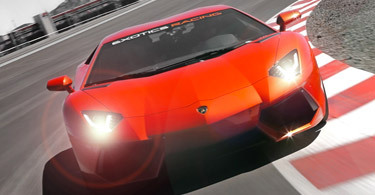 Birthday present, sweet 16 celebrations, graduation or bachelor party, Exotics Racing is the perfect place to celebrate. The Best Gifts On The Planet! Looking for an exciting gift? Something for dad or a holiday? Something that gets his adrenaline pumping? 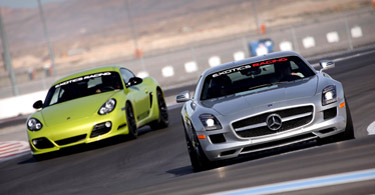 An Exotics Racing driving experience makes the most exhilarating gift in the world! With Exotics Racing gift certificates you are in total control. Pick any car in our fleet or drive them all! Select a pre-built gift package or specify your own dollar amount. With our all-inclusive pricing no additional fees or security deposit required, and all gift certificates do not expire. Remember, all drivers must be at least 18 years of age with a valid driver’s license. The “Power Package” allows you to access most of the exotic super cars in our fleet. Drive up to 2 of our supercars or choose from 11 of our most popular cars. Pick from our entire fleet of exotic supercars! Let them choose the driving experience of their dreams from 37 different cars. Create an ultimate package with the largest fleet of exotic supercars. 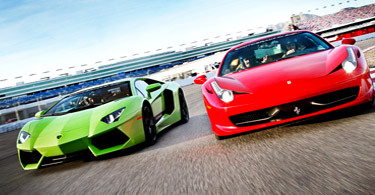 Booking your supercar driving experience is as easy as 1,2,3! 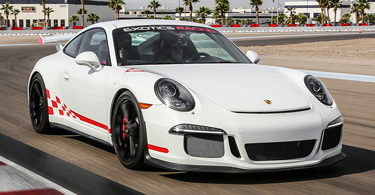 A full-day to improve your driving skills and get the best out of the Porsche 991 GT3. 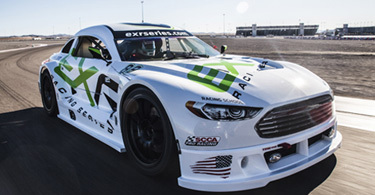 The EXR Racing School program is perfect for novices who have never driven a race car before or advanced drivers who want to improve their racing skills. By attending the 3-day EXR Racing School Program, you will learn the fundamentals of racing and improve your track skills and speed on track. We suggest arriving 15 minutes before your driving session with your valid driver’s license. Once you're checked-in, feel free to visit the pit lane to take pictures or relax in the lounge area until your classroom session begins. The interactive technical briefing will introduce you to our track and proper driving procedures that will make you a more efficient and faster driver. Later, you will be paired with an instructor who will help you to safely get the most out of your driving experience. Exclusive and only at Exotics Racing, ride along with one of our professional drivers behind the wheel in order to get a preview of our racetrack. The Discovery Laps are driven at moderate speed in order to explain each braking zone, apex, and acceleration zone. During this session, you will become familiar with the racetrack as well as how your body will react to the turns. 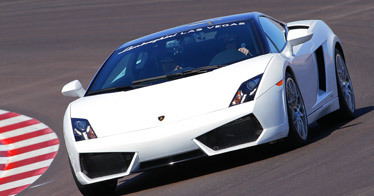 Get behind the wheel of a powerful supercar on our racetrack! Your personal racing instructor will help you get the absolute most out of your driving experience. The length of your session will vary depending on how many cars or laps you are doing. Enhance your experience by driving more cars and laps. With our Buy 1 Get 1 Free special offer, the more you drive, the more free laps you get on track. Also, if you want to drive different supercars, you can save up to $100 off per additional car. And don’t forget to purchase the ride-along experience; this will be the adrenaline-pumping ride of your life! At the conclusion of your driving experience, you will receive a Certificate of Achievement. An HD video from on board your driving experience that captures you in the driver’s seat and displays your track position, your speed, top speed, and your fastest lap time will be available for purchase. DRESS Comfortable clothes and closed-toe shoes required. No racing suits are required. Open-toe shoes, sandals, and high-heels are not allowed. Close-toe shoes will be provided to anyone who does not have proper footwear. DRIVER LICENSE Driver's license from any state or country required. Must be 18+. Your driver’s license can be issued from any state or country. Drivers must be at least 18 years old. Ride-along passengers must be tall enough to safely sit in the passenger seat of the car while properly wearing the car’s standard seatbelt. HELMETS & INSURANCEHelmets are provided on track at no cost. Insurance is included. You must properly wear your helmet throughout the entire time in the car as a driver and passenger. Helmets are provided at no cost and all standard helmet sizes are available. Insurance is included with no deductible. DRIVING CENTER Stunning Driving Center with premium facilities and panoramic viewing terrace. Our Las Vegas EXR Driving Center is a state-of-art 14,000 square feet of hospitality space and provides premium services with private café, relaxing lounges, Wifi, AC and VIP area. Drivers and guests can watch the supercars on track from the panoramic rooftop terrace with an astonishing view on the whole racetrack. FRIENDS AND FAMILY Friends and family are welcome to join you at the racetrack. You and your guests may take as many pictures and videos as you want while remaining safely off of the track and flow of traffic in and out of pit lane. We offer a complimentary shuttle service from the ARIA Resort & Casino to our Las Vegas racetrack. We also provide a complimentary parking if you want to come with your own vehicle. Other easy and affordable transportation services such as Uber or Lyft will be the quickest and most flexible way to get there. For the Supercar experience, ride in a limo with our partner Presidential Limousine. Join our mailing list to receive up to date information on upcoming races, special offers, events and news from our team!